Learning objects differ from conventional learning materials in that they use a variety of media sources including text, graphics, audio, and video (Muirhead and Haughey, 2005). Learning objects are essentially the digital resources (e.g., audio, photos, graphics, animations, video, Word/PDF documents, HTML pages, Java applets, and interactive exercises) that are designed to generate and support learning activities and enrich learners’ experiences (Richards, et al., 2002). Within the last five years, institutions and academics have developed approaches to facilitate access to a wide range of learning objects to support teaching across the curriculum. Suthers (2000) believes that this interest is motivated in large part by the desire to be able to find and reuse the work of others. Institutions (such as Institute of Electrical and Electronics Engineers or IEEE) have developed standards for learning object packaging. Although learning objects could be reused in many instructional contexts, much of this investment is used for specific audiences and remains unknown beyond the immediate developers and consumers (Richards, et al., 2002). Wiley (2002) indicates that learning objects are generally deliverable over the Internet, meaning that teachers can access and use them anywhere and simultaneously (as opposed to traditional media, such as maps or videotapes, which can only exist in one place at a time). Moreover, teachers can collaborate on and benefit immediately from new versions. LORs provide faculty, teachers, curriculum developers, and students with easy access to a large storehouse of learning objects that can be shared and used within and across universities and schools (SREB, 2005). According to JORUM (2004), it could be argued that a repository, at its core, is only a database of objects, with import and export interfaces. However, there is a distinction to be made in LORs between the database (that holds the metadata and objects) and the tools that are used to interact with this database (by searching, downloading, importing, etc.). 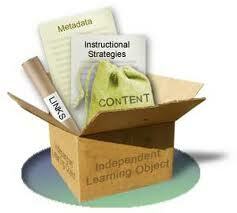 A review of existing learning object repositories reveals that a repository is essentially a file storage system that has a form of control over the quality of the files (learning objects) to classify and store them using metadata, a searchable database to categorise and locate learning objects, an easy-to-use mechanism for uploading, updating, retrieving, and exchanging learning objects and an appropriate technical infrastructure, including software (e.g., database, and security system) and hardware (e.g., server and telecommunication capabilities).